Saturday, March 14, 2009, 10 a.m. to 7 p.m.
Andre Shepherd will discuss his asylum case in Germany and why he deserted from the US Army and refused to deploy to Iraq. He will detail how, after his deployment to Iraq, he came to realize that he couldn’t support the occupation there. Martin Webster will talk about the video he filmed of British soldiers beating Iraqi civilians. He will also discuss how he has coped with post traumatic stress disorder. Christian Neumann will explain how NATO is more dangerous than helpful as an ally for Germany. An active-duty member of the German armed forces, Neumann will talk about why NATO shouldn’t impose its values on other cultures, including in Afghanistan, where he served in 2007 and 2008. Chris Arendt will speak about the homeless veterans, about the treatment for their psychological disturbances and about “combat paper“, a method of turning uniforms into paper, which the homeless veterans use to support themselves. Dave Cortelyou will play an audio recording about his experiences in Iraq, his difficulties after returning home and his resistance against further engagement in Iraq. Lee Kamara will talk about the initial invasion of Iraq from a British soldier’s perspective and how he has suffered and dealt with his post traumatic stress disorder (PTSD). He’ll also talk about a project entitled Voices of War that is linking veterans through art. Eddie Falcon will talk about his work of transporting detainees from Baghdad to Basra Prison. He describes it as a “dehumanizing process” that included blindfolding and strapping Iraqi civilians to the floor of the cargo compartment. He claims racism is helping keep up support for the war in the minds of soldiers and the public alike. Zack Baddorf will discuss his role in the US military’s propaganda machine and the mainstream media’s complicity. He will also talk about his experiences in the Persian Gulf, protecting Iraq’s oil terminals. 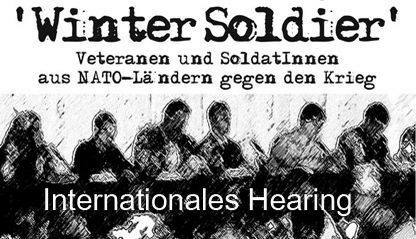 Iraq Veterans Against the War: Winter Soldier Europe Schedule. March 8, 2009.